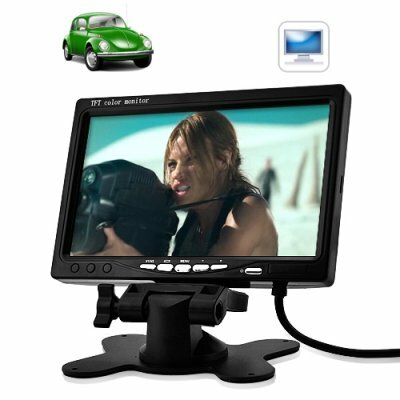 Successfully Added 7 Inch HD LCD monitor - In-Car Headrest or Stand to your Shopping Cart. This high resolution 7 inch LCD monitor is a quick and affordable way to transform your boring ride into a fun and entertaining experience. It features dual video input connections so you can connect your DVD player, digital TV receiver or other video sources, and it's the perfect size for placing on your car’s dashboard for use as a rear-view parking monitor. This headrest monitor (also dash mount monitor) features an impressive display resolution of 800x480. This allows you to enjoy beautiful high resolution widescreen images that really bring your movies to life. It also comes with a fully adjustable mounting bracket that can be placed on your car's dash board. Or with a little handy work you can use the built in bracket to mount this device into the back of your headrest. With its slim profile you can literally mount this device anywhere you like. If you’re looking for a high quality and affordable in-car LCD display then this is the perfect device for you. Order today and we will ship out your order within 24 hours and even include our famous 12 month warranty. Available only from the leaders in wholesale electronics, Chinavasion! Does this device have a built in DVD player? No, this device only functions as a monitor. You can however connect it to your existing car DVD player. Picture quality is truly excellent, great for watching DVD with subtitles. Description mentions A/V and Vol+/Vol- which suggest there are audio inputs and/or speaker, but this is not the case. This monitor is video only. Settings are stored and memorized. In short - a very good monitor. The shipment was very well protected. The item contained all the items described. All items were brand new. The monitor does have HD resolution. You can barely see pixels even if looking up close. The only negative about this monitor is top viewing angle. Great HD monitor given the price. Chinavasion.com has a great service. Will recommend. Good monitor with reasonably good image quality given the low price. Very easy to use. Short user manual for the connections. Great monitor. Has 2 AV in jack (1female, ! male) so you are always able to connect. Has nice remote control. And what impressed me most, is capability to show image in reverse modem and in upside down way. Adjustment is simple, like on TV. Delivery was quick and package was well protected.